Born in Havana, Cuba, Jose “Pepe” Espinosa in one of the best known and most versatile percussionists today. A veteran of over 80 recordings, his extensive resume boasts tours with Cubanismo, the Afrocuban All Stars,Arturo Sandoval, Chucho Valdés, Gonzalo Rubalcaba, Frank Emilio Flynn, and many other orchestras and small groups. 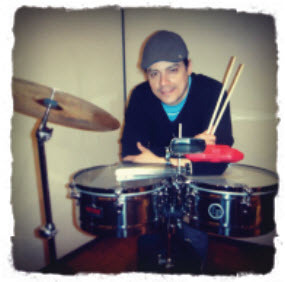 His vast knowledge as a professional musician in so many different settings along with his expertise in the recording studio make him an ideal partner in Aguanko’s debut recording “Elemental”. His musicianship and guidance have helped the debut recording to be a successful, high-quality release. His work in the studio included recording timbal, bongo, and small Percussion instruments, but also in mixing (along with Alberto Nacif and studio engineer Geoff Michael) to achieve the special sound of this recording. Look for Jose “Pepe” Espinosa’s first CD release as a leader later this year!